Mood board: Last season, Craig Green was inspired by the vastness of the oceans, his models – like bold fisherman or divers chartering a watery abyss – clad in sou’wester hats and chunky outerwear evoking traditional deep sea diving suits. For S/S 2018, an oceanic thread continued to run throughout Green’s designs, but one more beach-focused, drawing parallels to surfers in clear blue seas or nomadic travellers walking tropical shores. Zip up neoprene tops- pulled, ruched and tied in Green’s signature style, or embellished with lengths of rope- resembled wetsuits. 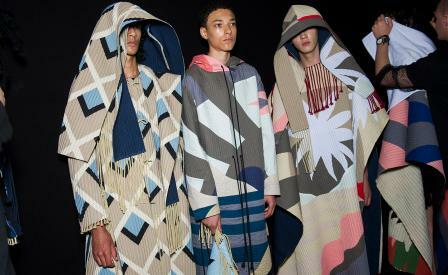 Colourful ponchos and long hooded tops, patchworked with tropical sunrise details, resembled the garb of long-time hippy travellers or bright fringed towels picked up in beach shops by sun seeking tourists. Scene setting: The show was held in a series of murky and misty railway arches nearer Southwark station in south London. This lent a darker bent to the colourful patchwork pieces in the collection, reminiscent of the darker tropes of paradise in Alex Garlands The Beach, or William Golding’s Lord of the Flies. Best in show: The show saw a return to Green’s use of architectural structures, last seen on the catwalk in S/S 2016. Models held wooden forms, used as frames for khaki, light blue and colourful fabrics in front of their faces, their physiognomy concealed. This uneasy element of disguise was also emphasised in Green’s hooded ponchos, colourful in their materials but more monastic and disconcerting in their ability to shroud the face in mystery.